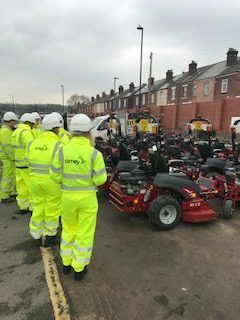 In February we officially launched our Forging Ahead programme, which resulted in three individuals gaining permanent employment with Amey Sheffield. Forging Ahead provides pathways to permanent employment for individuals seeking a life away from crime. We work alongside Total Training Provision, Her Majesty’s Prison and Probation Service, South Yorkshire Police and a range of employers, to deliver a three week training course which provides skills and qualifications crucial to moving forward into employment. Three individuals recently completed the training programme, gaining permanent employment with Amey Sheffield. “Forging Ahead combines the passions of individuals from within the criminal justice and charitable sectors. Together, our aim is to create opportunities of employment for individuals with a history of offending behaviour. We want to change the landscape of employability for ex-offenders” – Stu Otten, About Face and Forging Ahead Co-ordinator. Our current partner employers include Amey Sheffield, Sainsbury’s, Gripple, Timpson’s and Sheffield International Venues (SIV). We are currently in the process of partnering with more employers and discussing future plans for apprenticeships, sponsorship, donations and endorsement.